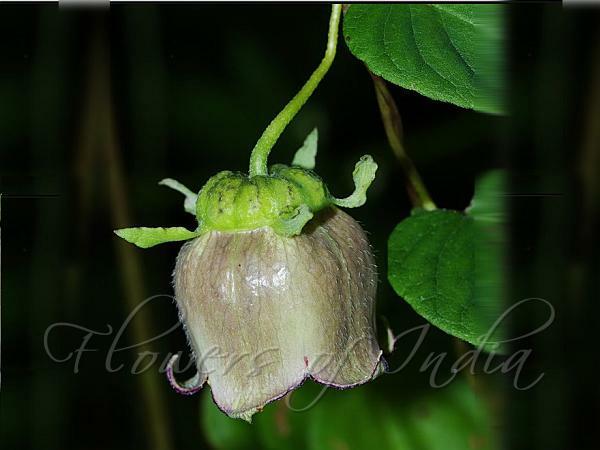 Green Bonnet Bellflower is a herbaceous climber, abundant in the Himalayas. Leaves are 5-7.5 cm long, pale green. The vine has greenish yellow bellshaped flowers in summer. The bell shape is wide and short, and has purplish markings inside. Flowers are 2-3 cm long, with a long stalk 2-7 cm long. Sepals are linear to linear-lanceshaped, 1-2 cm long, 2-3 mm wide. 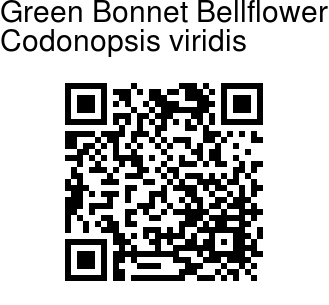 Green Bonnet Bellflower is found in the Himalayas, from Uttarakhand to Bhutan, at altitudes of 1200-3000 m. Flowering: August-September.